Remember when I showed you my whiskey barrel newly planted with petunias, brachome, bacopa, pony tail grass, alyssum and verbena? I had a double decker planter with a mop bucket placed in the center. 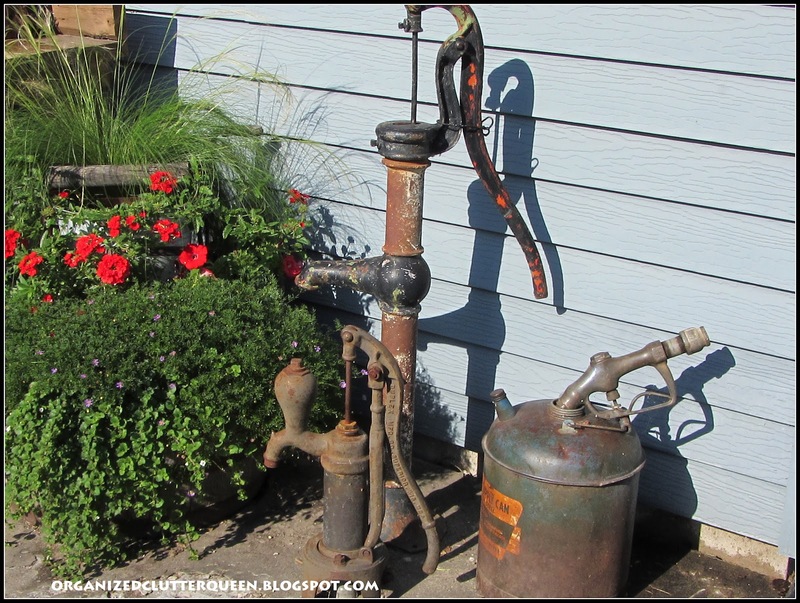 I also showed you my vintage water pumps and gas can with Buckeye gas nozzle. Things were off to a good start here the first part of June. Then I had a cutworm caterpillar attack of epic proportions around the 20th of June. Hundreds of them on the plants in the potting bench area. I picked them off, used Ortho-max and Sevin, but the caterpillars still managed to do some real damage. 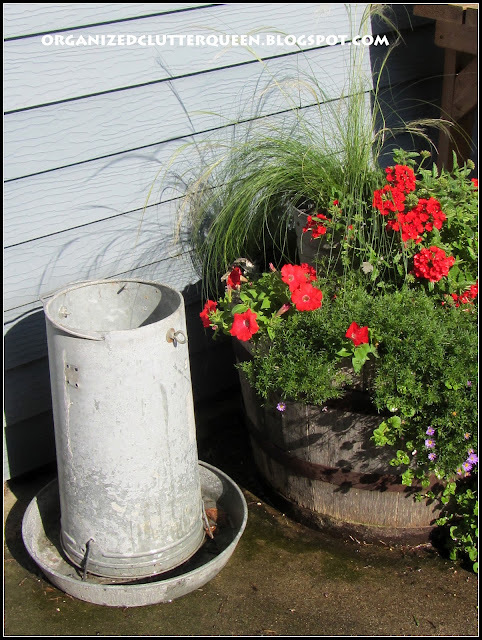 The mop bucket in the barrel planter is hardly visible anymore. My hanging pots are galvanized pails. 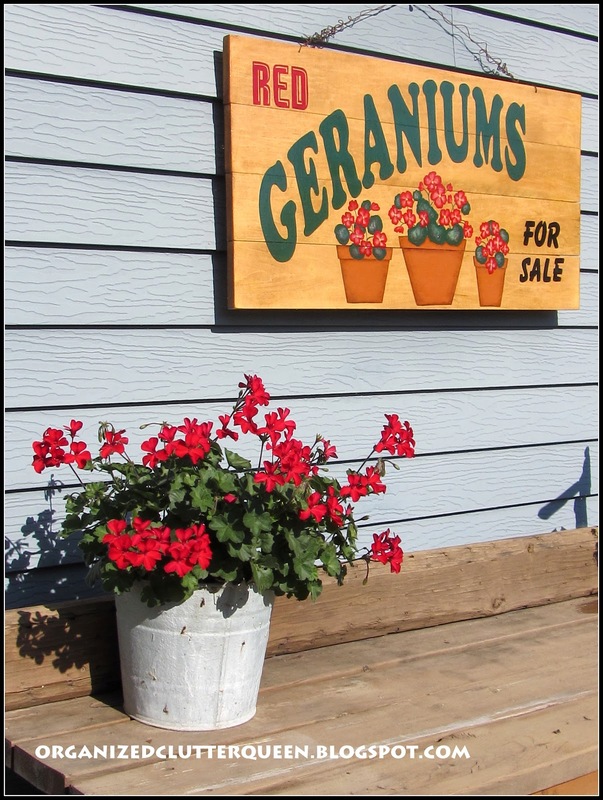 My sign above the potting bench, painted by a friend that owns the Tattered Angel here locally. 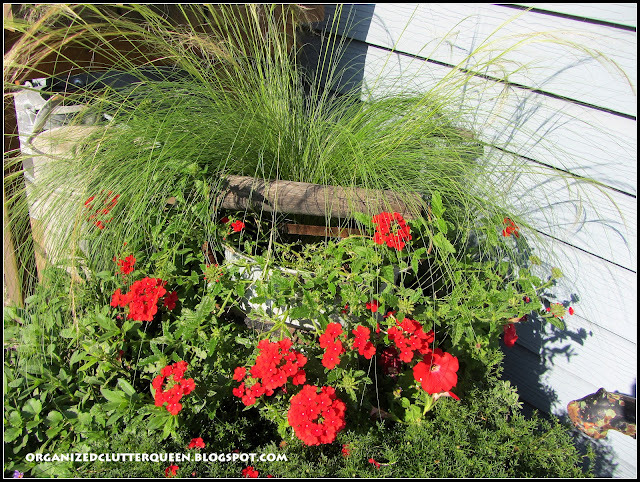 A caliente red geranium in a galvanized pail. 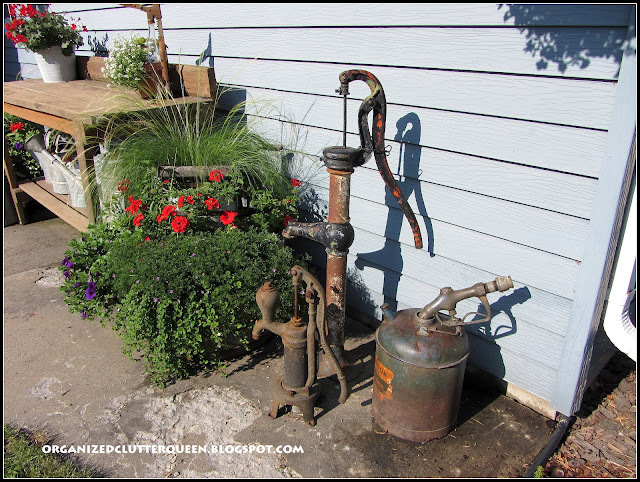 The whiskey barrel on the opposite side of the potting bench has a chicken feeder and galvanized watering can beside it. The bottom shelf of my potting bench (which is actually a cheap Menards work bench kit) holds most of my watering can collection, including the European one on the right. And this is what the potting bench and planters look like all together. 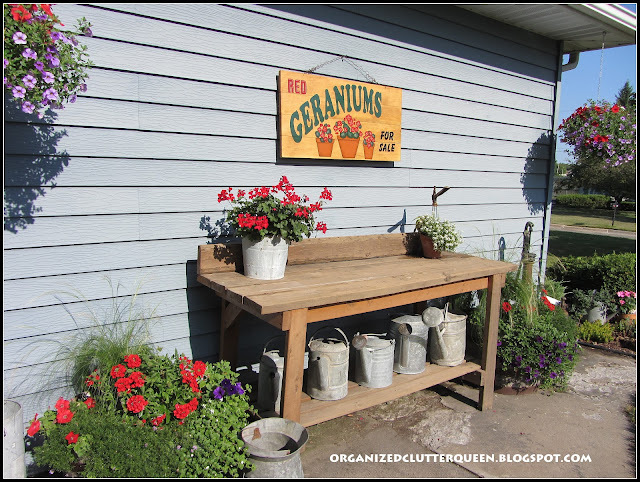 Hope you enjoyed the potting bench plantings and garden junk! Please remember to enter my Ramsign enameled house sign giveaway now through July 31st! Enter here. 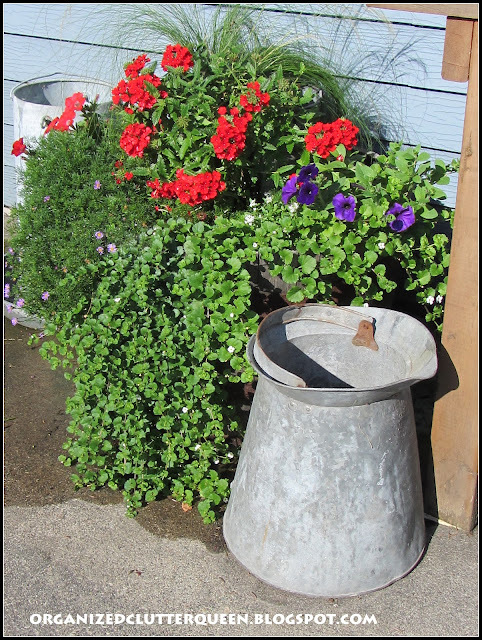 I have two of the old watering cans. I have two of the oak whiskey half-barrels. I have three old water pumps. I have the galvanized pails. And I swear my siding is the same! What I don't have is the style and charm of what you have put together here. The pail as planter really intrigues me. 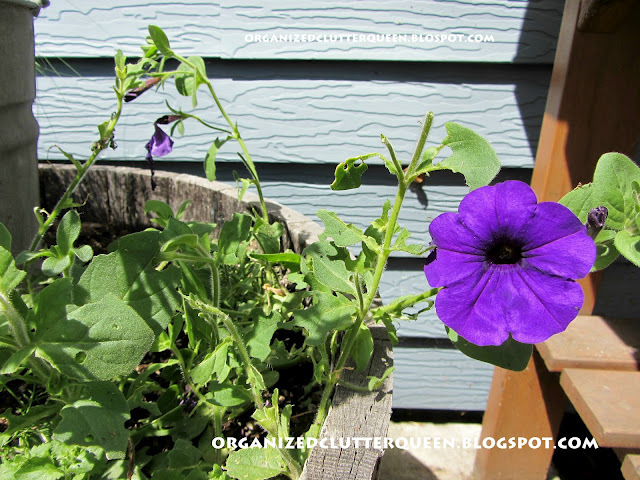 Do you punch holes in the bottom or fill with stones or broken clay pieces for drainage? I would love to try that. The mop buckets and galvanized pails have holes in the bottom. I pound a large nail through them about 5 times. Your blog photos are gorgeous! 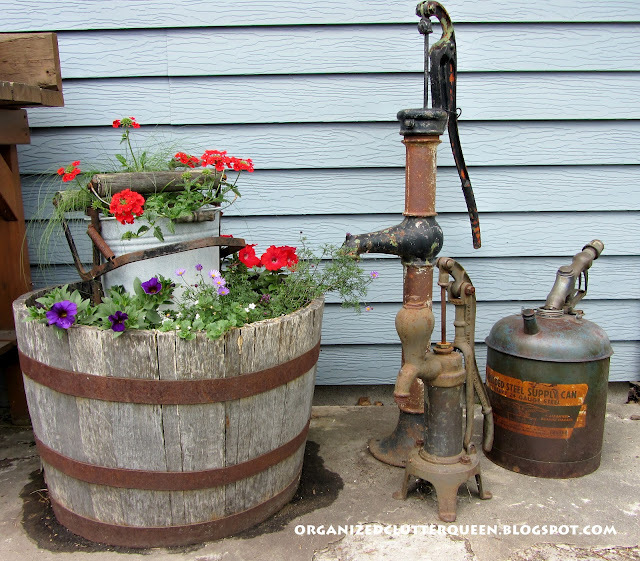 I love what you did with the potting bench! Thanks for sharing! I truly did enjoy seeing it! I'm housebound, so I have to look at flowers virtually now. That is a beautiful site to see! Your flowers are looking great! Mine are not doing too well in this heat but I know which ones to plant next year and which ones can't handle the heat! 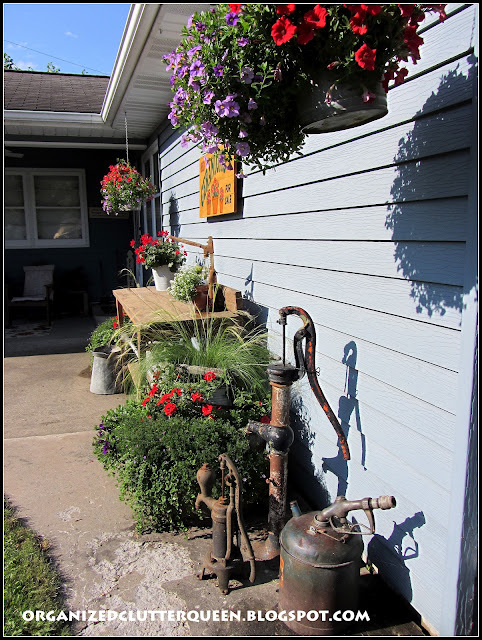 I love all your watering cans...what a collection! They're not cheap anymore! It looks fabulous all together!!! 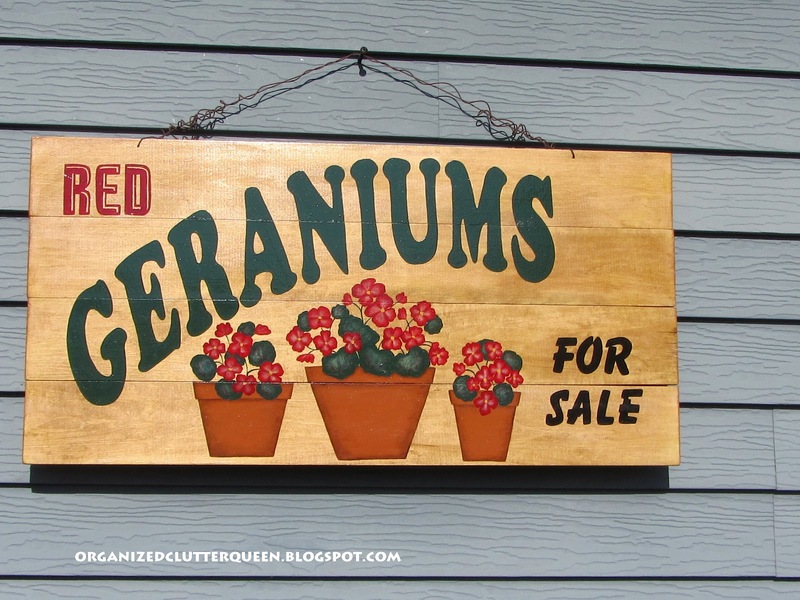 Love all the galvanized pieces and the geranium sign is the perfect accent piece! Your flowers are awesome! I never got much planted this year because I was away from home so much but I hope in the fall to plant some things. 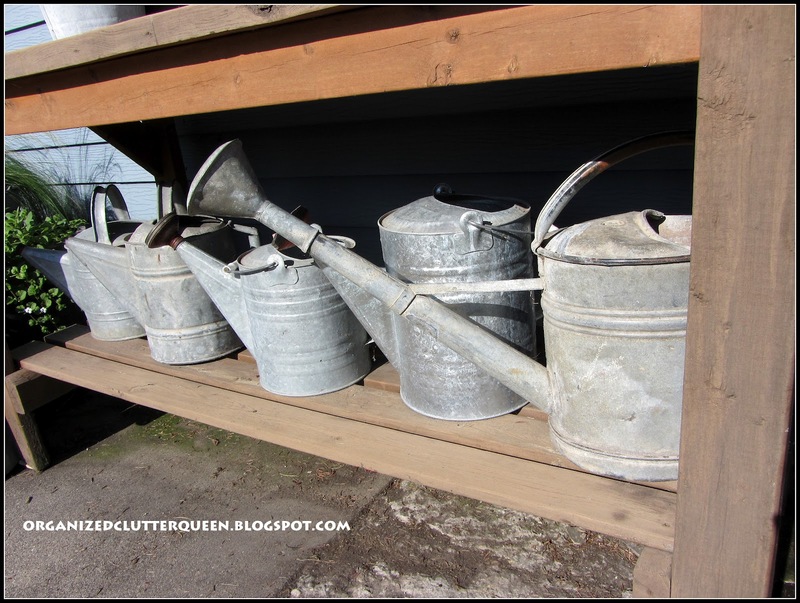 Love your galvanized watering cans...I'm on the lookout for one to add to my potting bench! I do love this! Love those watering cans too! 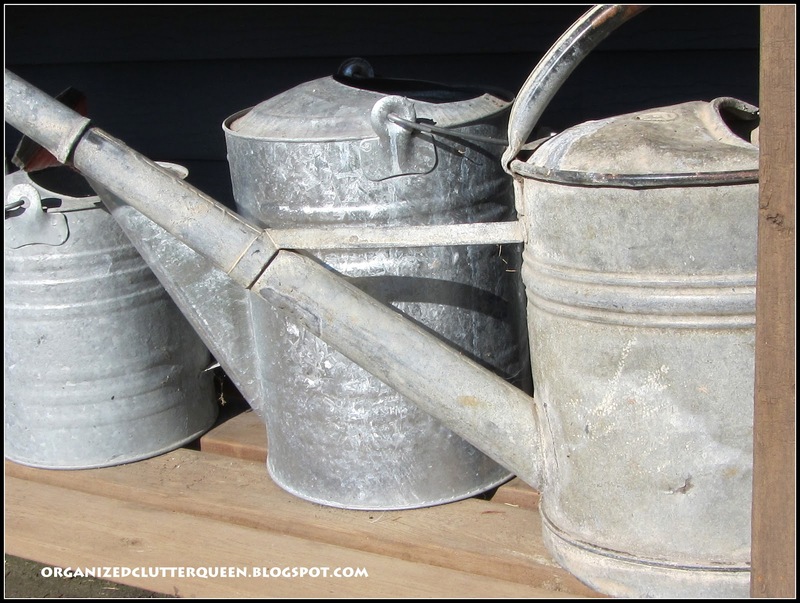 Loving you galvanized watering cans and pails! You potting bench looks cool, doesn't look like "work" bench! 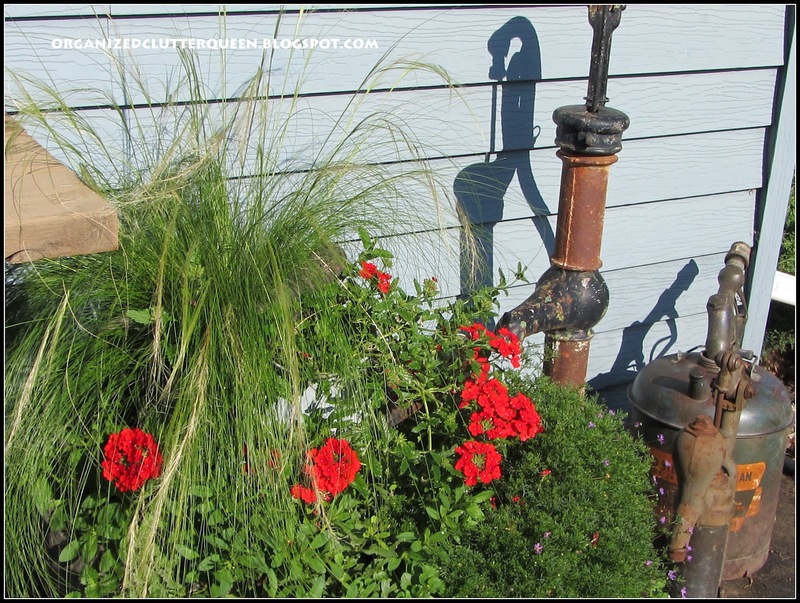 All your planters look so pretty, great garden vignette! So glad you shared your creative inspiration with Sunday’s Best – your creativity helped make the party a success! 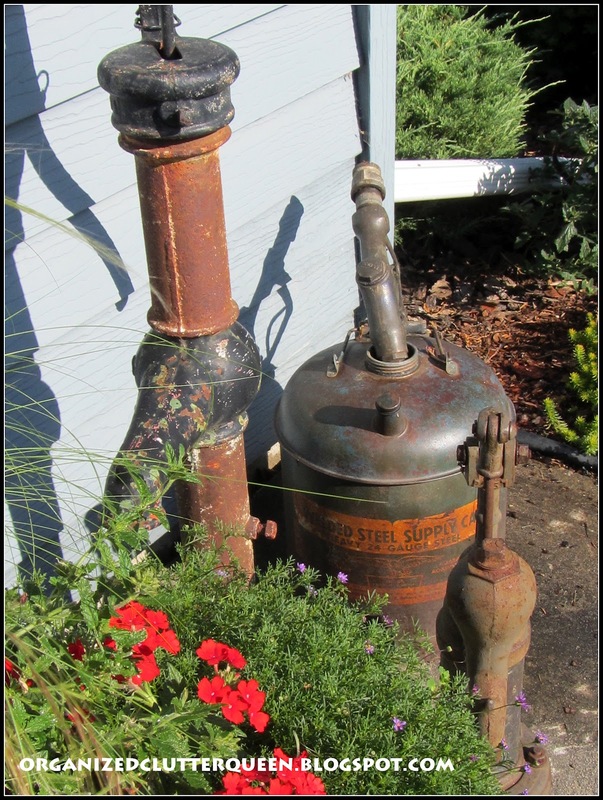 Love the galvanized watering cans and repurposed stuff. You have so many. 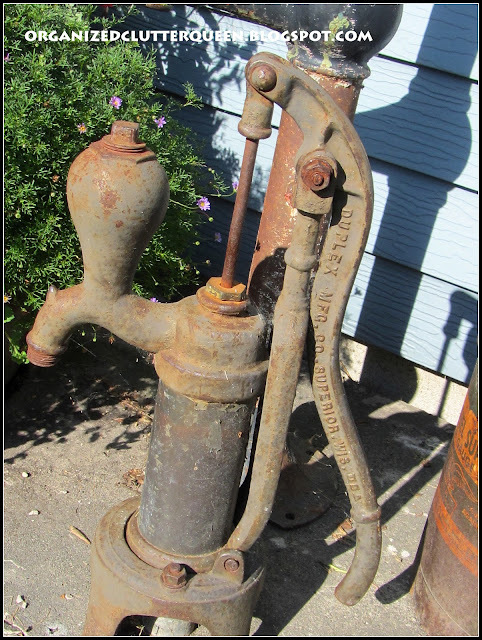 special... love the old water pump! Love the watering can collection. Your plants have recovered beautifully Carlene. 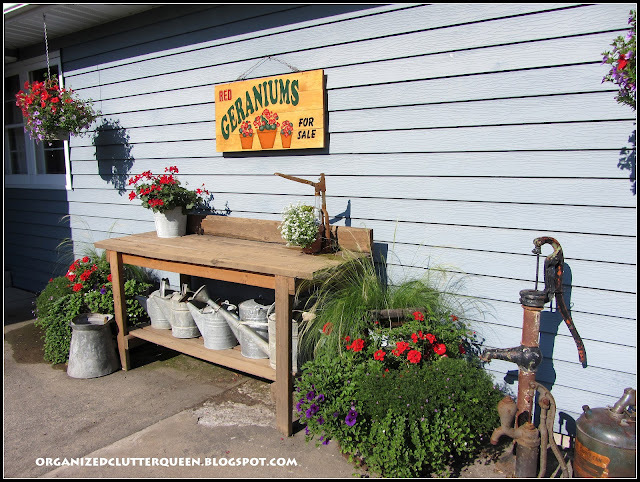 Love your potting bench and your collection of watering cans. How fun and everything looks beautiful! I love potting benches. Mine needs a good scrubbing. It is so neat to have a watering can collection. Plant photos are great. Gorgeous display! Love the pump! Everything looks wonderful! 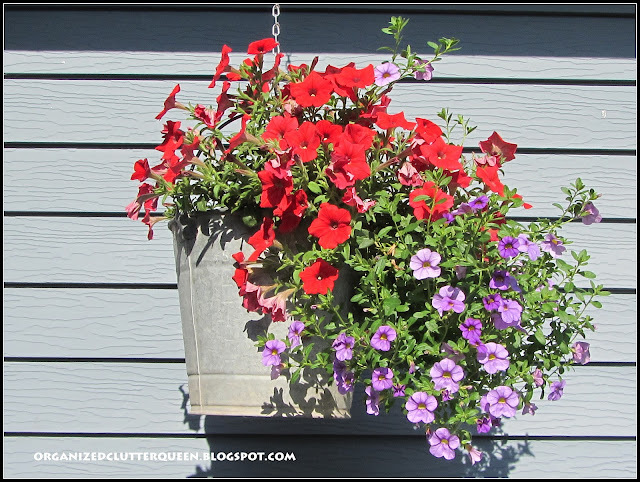 I love your potting table and all your "planters" Your floweres look fantastic! This is just awesome..you did an excellent job of bringing CHARM to your potting area. I am about to publish a post on potting benches throughout Blogland and would be thrilled if you would let me use some of your photos and include your cute potting bench in my post. Would this work for you? YYYESSS! 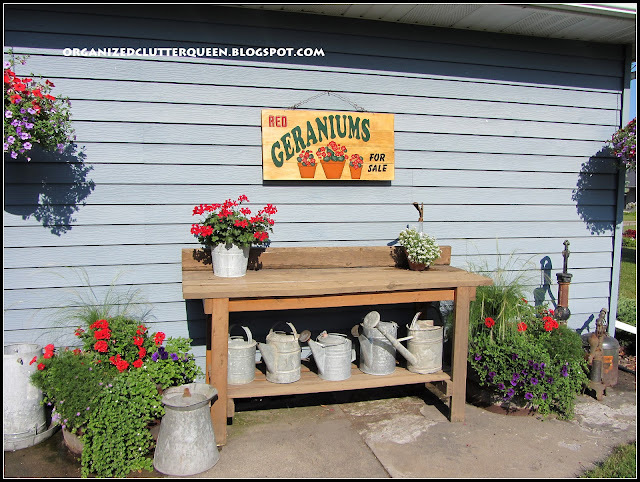 Love galvanized with flowers with rustic potting benches. I'll take it! 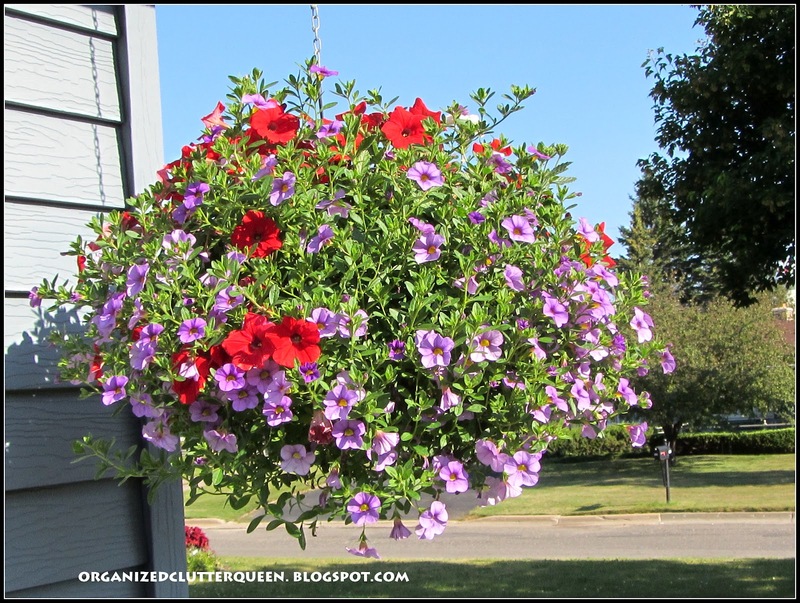 :) You sure have a green thumb, Carlene!